Hey, folks. Chief here with another weekly update. It is going to be a short update since there isn’t a lot of things happening. It’s pretty rare when I have a week that is almost solely aimed towards writing. Normally there is a lot of setting up art commissions, listening to audio from SFX and music, coding games (some mini-games that probably won’t be included in this game), and other odd activities that keep me darting around. Not this week. It’s pretty weird not running circles as the studio head. Wordcount: 6,441 (So, there I was, happy that I had completed the Act 2 core. I was getting ready to finalize the script and send it off to the voice actors when I realized that I had completely forgotten to include vocal sections when you run into characters during your investigative scenes. These small scenes add to the story and help with character development. I was upset that I had forgotten to include them for Act 2 and spent a pretty healthy amount of time adding them in for each character. Just as I was finishing those up and getting ready to finalize again, I remembered that I had forgotten write a very special scene. Voice acting auditions are ending in a couple hours. That’s right, you don’t have to hear me promote them any more! We’ll be reviewing all auditions and should hopefully have a list ready for the weekly update! All physical merchandise is out the door. Some of it didn’t make it out originally due to a box getting lost when I moved apartments. This is the first time the studio has ever done physical items and it was a pretty painful learning experience over all. If anyone wants some of the details and stories, I’m willing to do a hotwash about the lessons learned. Rising Angels: Hope is currently delayed. I’m very, very, very unhappy to have to say that, but it is an unpleasant truth. While all of the chibi CG are done, the CG art for the game is delayed. It’s unfortunate as these CG have been in development for… a year now, but that is the pain of development. Thankfully, Fates’s CG artist is quite speedy and I doubt we will be seeing the same problem twice. The good news is that delays are letting me play around more with the GUI and adding some more minor scenes to the game. Anyway, short night. Just wanted to get those quick updates out so people didn’t wonder too hard why Hope wasn’t out yet. After Hope is finished, I’m going to be moving on to finish up the coding of Spark. Got a good lineup of things coming soon. As a reminder, if you have any lore questions or whatnot, I’m always up for some story telling. Until then, Chief out. For the video o’ the post, let’s go with a bit of a classic. It’s hard to think that the once overwhelming cult of this has evaporated. Makes me feel old. Hey, folks. Chief here with your weekly update. Are you in a good mood? I’m in a good mood. I’ve finally recovered from my illness and get to return to my flying job next week! That means I can get back out there earning and saving money that can be used to increase the amount of awesome things in Fates! That, and I hate sitting at a desk. The old man isn’t one for sitting at home living a 9 to 5. Those stories of excitement and adventure you all enjoy have to be inspired from somewhere, right? Until then, let’s talk Fates. Wordcount: (6,010; Focused a lot on finishing up Act 2 as quickly as I can. I really want to get off the Planet of the Elves and continue my journey. A lot of focus this week was on the investigation sections of Act 2. Though this may come as a shock to you, I’m an old hand at Phoenix Wright games and enjoy them a lot. One thing that bugged me about Phoenix Wright though is that there is always only a single correct answer. A specific line and a specific piece of evidence is needed to move things along. I get it at points, but there were several cases that had me banging my head against a wall because I had a clear cut solution and the game didn’t like it. I’m going into this with the idea that there should be multiple solutions to a particular investigation, multiple clues that could answer your mystery or take it on a completely different path. Act 2 is the first point where the clues and how you react to them will influence the story. A particular moment I want to share involves Lenna Edeck, Sol and Faye’s old love interest. During the course of talking with her, there will be several moments where you can use clues gathered to either realize that Lenna isn’t sharing her facts. Pressing too hard, however, can turn Sol against you pretty quickly. He still loves Lenna, and if you want to press her too hard, you can expect the investigations with him to be a lot more difficult. That does increase the amount of writing I have to do though, which is why I’m considering that additional writer. Art: Still working on the blinks and movements of the characters. I do have a pretty awesome thing to announce. Originally, we didn’t have a character sprite for Natalie. Much sorrow. The sprite artist wasn’t going to be able to finish her off. However, thanks to the awesome Geckos, who is doing those animations, we now have a sprite for Natalie. That’s right, you aren’t going to be forced to do all Natalie/Name scenes from Natalie’s perspective! It also opens the possibility of side sprites again. I’m really, really, really excited. A couple characters are also going to get additional outfits as well. 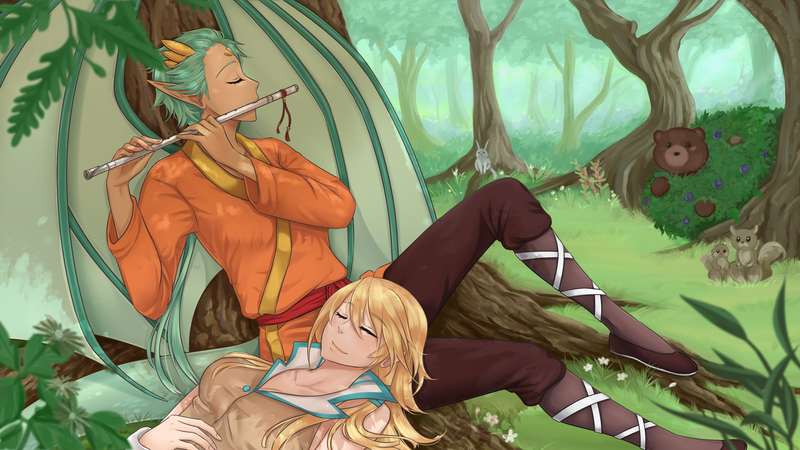 Advertisement: Speaking of Geckos and her art, if you have a few spare dollars, please consider backing her kickstarter for a pretty awesome visual novel called Brilliant Shadows. I’ve gotten to do some admin support for it and I’m pretty excited about it. You can check it out here. Voice acting: One last week to get your auditions in! Lore: Now, for this week, we get to talk about something a little less… happy. While I do have some experience with chemical and biological weapons, I didn’t put a lot of thought into what hit Faye on that desert planet. I knew what I wanted to happen and lore didn’t really catch up. However, as her illness is going to be a pretty strong point in her route (dying tends to be a major life moment), it had to be worked out. Thanks to the help of the Eve writer, we now have a very detailed list of effects to what Faye is now suffering from. Qudratexadon uses an ibotenic acid base to disrupt the lupide immune system, thus allowing it to take hold without being combated effectively. It causes inflammation of the alveoli, thus limiting gas exchange between the lungs and blood, and causing a buildup of fluid in the lungs. Qudratexadon poisoning directly causes effects to other parts of the body as well. Tissue hardening between brain hemispheres is a common symptom of Qudratexadon poisoning, and causes emotional turmoil, as the brain can no longer properly regulate emotion with reason (the effect is more profound in people that were predominately logical, as those mental tendencies are disrupted). Muscle development becomes hindered, and while the effect is generally universal, most cases are afflicted with uneven loss of muscle mass. In the worst cases, this can cause muscle spasms so severe they appear to be seizures, though most cases simply inhibit basic motor functions. Higher doses have a profound effect upon the nervous system, mainly damage to the nerves along the vertebral column and brain stem, causing impaired touch sensitivity, muscle paralysis, blurred vision, and possibly death. I’d like to take a moment to mention that Faye is one of my favorite characters, she’s been in 3 visual novels so far. That being said, she is a very, very sick lupide who had the misfortune of ending up in a bad situation. Should she be out there? Definitely not, even with a specialist doctor following her around. Even though she’s a very lazy, very laidback person, Faye’s not going to abandon her friends in their time of need. Will Name be able to help her keep going or will Faye succumb to such a terrible disease…? Faye will be one of the hardest characters to keep alive in this story (both from external and internal problems), but you can do it. With that bit of lore, I wrap this up for the evening. Remember not to contract deadly toxins! Until next time, Chief out! Hey, folks. It’s time for some Saturday Night Fever! After finally earning the murderhobo title after a crazy night of Dungeons and Dragons (broke time and space at one point…), I’m here to give you the weekly update! One thing I’m actually kind of surprised about in Fates is that we don’t really have any murderous or hobo-like members in either Natalie or Name’s groups. It’s weird. If this was an alignment scale, most of the cast would be lawful good or neutral good. Kind of tempted to plot that stuff out when I get a free moment… ANYWAY, back to the update! -Wordcount: (Honestly, with as much editing as I’ve done this week, any wordcount total is probably going to be negative. As the scripts for Act 2 are being finished up for the voice actors, I’m trying hard to make sure that they’ve got clean scripts and that everything is exactly how I want it. If I fub a section and it is already voiced, my options are limited to redo the scene’s voices or retool further story to polish over it. The first option costs time and money, the second option costs story flow. As a man of the flight deck, I’m very much used to the world where most of the time being right isn’t acceptable. That’s why I’m being remarkably detailed and thorough in planning my events, just like I’d plan a flight. -Voice acting updates: Voice acting auditions are still going on and you are probably not going to hear the end of that until they end, I apologize. More information can be found here. All of the voices for the first act by the major characters are finished up. Right now, I’m just waiting on the director to go through and make sure everything is okay. For those of you who have been with IDHAS a while, you’ll remember that I’m a bit leery towards voices. However, after the stellar auditions and the success of the voices in Perceptions of the Dead, I’m very stoked about having the voices in Fates. I can’t wait to share some of them with you all. -Art: Right now, there are two major areas of art that are still going full steam ahead. The first one is the CG. I’m still pondering doing chibi CG for the more comedic/light-hearted moments, but I’m still very much on the fence. It works better for RA: Hope, which is a slice of life. Fates isn’t as light-hearted and I’m still leery about adding chibi to a serious investigation. While that is resolved, the focus is still very much on the normal CG. I realized that a finished CG has not been shown and I wanted to take today to show one off. Link for the full size version. The other art area starting up is the animation of the sprites. Ear wiggles, blinks, wing flaps, and (maybe) tail wags are being done and coded in now that the sprites are completely finished. I’ve said it before and I’ll say it again, I like having little things like that to add movement and life to the world. Wrapping up tonight. I’ve got to go into work tomorrow to approve some stuff, so I should get to bed. Until next time, Chief out! Video of the post… I have no clue why, but I like the song. Hey, folks. This weekly update almost didn’t happen. Why? Because I nearly burned down an apartment building. As you may have gathered from last week’s post, I was in the process of moving. After more trips up three flights of stairs than I want to ever do again (until I move out), I was almost done. Then I realized I had one day to completely clean the 3 bedroom apartment. Seven hours to be exact. Pretty much by myself. Fuzz had left a lot of stains and messes for me to scramble and clean. I almost submitted to the temptation to clean by fire, but then I realized I had packed my lighter away. So, in the end, I got to waste most of last week moving and cleaning. This week’s lesson for all of you is to bu… can’t say that… plan ahead? -Voice acting auditions are still going on. If you haven’t gotten your audition in, there is still plenty of time as auditions will not be closing until the 24th of April. More information can be found here. -Soundtrack is progressing well and should be done by sometime in June. -We may possibly add another writer to help ease the burden on myself. While I am an experienced writer with a lot of time behind the keyboard under the belt, this week has proven how even the best can get beaten down by real life. Another writer would help mitigate those problems and also reduce the burden on me. While I am not completely committed to this idea yet, I will accept any interested writers’ applications at overwatch@idhasstudios.com . Just make sure you send over a sample of your writing, preferably a completed visual novel. It would be a paid post, I’d just need to figure out what the budget can afford. -Hope is going well and should be out sometime later in the month. For those of you who are new to the weeklies, Rising Angels: Hope is the remake of the original game, Rising Angels: The Red Rose. The story is being fleshed out and finished, the GUI is being implemented, CG are added, and all in all, it should be a fun time for all. We’re still working out the cost as there has been a recurrence of the free for all to enjoy vs raising some money to help add more things to Fates debate. It’s a philosophical debate that will go on forever, I think. Either way, all backers of Fates and studio donators will have it for free and two weeks early when it is finished. Right now, we are waiting on the last of the CG. -If you all have not had the chance to play Perceptions of the Dead, I highly recommend you check it out. It’s a fully voiced short horror VN done by our awesome partners over at Ithaqua Labs! Geckos is an awesome artist; Nyogtha a talented writer. There’s a lot of cool effects in Perceptions that we are hoping to add to Fates, so… GO CHECK IT OUT! Android version can be found here, PC/Mac/Linux can be found here. Anyway, I’m wrapping it up. Not only are there a bunch of NaNoRenO games I want to try out, but I need to work on getting back on track. Until next time, Chief out! Video of the post is one you all should take to heart! I often ask myself it playing Heroes of the Storm!